Today in Masonic History Guy Mark Gillette is born in 1879. 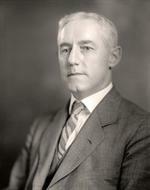 Guy Mark Gillette was an American politician. Gillette was born on February 3rd, 1879 in Cherokee, Iowa. He attended local schools before graduating from Drake University Law School in 1900. He was admitted to the bar that same year and began practicing law in Cherokee. He served during the Spanish-American war, although he did not see any combat. He also volunteered to fight against the British in the Boer War but was turned down. Gillette started his public career when he became the city attorney of Cherokee serving from 1906-1907. He then became the prosecuting attorney of Cherokee County serving in that position from 1907 to 1909. He was elected to the Iowa state Senate serving from 1912 to 1916. After leaving the state Senate, he enlisted in the Army during World War I serving as a captain. In 1932 Gillette, a Democrat, was swept into office in the United States House of Representatives during the Roosevelt Landslide. He was elected twice to that seat, although did not serve both terms. He was elected United States Senate in 1936, to fill the vacated seat of Senator Richard Louis Murphy who had died in a car accident. Once in the Senate, Gillette opposed parts of the New Deal. Specifically he was against the new wage and hours bill and aspects of the Social Security system. Because of this, Roosevelt targeted Gillette to be replaced in the 1938 election. Despite Roosevelt's efforts Gillette was reelected and the rift between President Roosevelt and Gillette grew. After the attack on Pearl Harbor Gillette criticized the Administration of not being properly prepared to deal with the loss of rubber to do the war with the Japanese. Specifically Gillette felt that the President and his administration should have been looking at ways to make rubber from corn. In 1943, the British Foreign Office had confidential assessments done on the United States Senate Foreign Relations Committee. In the report Gillette was described as more of a Republican than a Democrat in his voting record. He was considered something of an isolationist, although not a threat to any aid that was coming from the United States to Britain. In 1944, Gillette lost his Senate seat. From 1944 until 1948 Gillette held a variety of jobs. President Roosevelt put him on the Surplus Property Board, which promoted separate articles in the Washington Post and Life Magazine to state that the President was confused the problem was surplus property, not surplus politicians. Gillette did not stay on the Board long leaving in 1945 when he became the president of the American League for a Free Palestine. The League was disbanded in 1948 when Israel became a state. In 1948, Gillette made a comeback, getting elected to another term in the United States Senate. In 1951 one of the sub-committees he was on conducted an investigation into the campaign practices of Senator Joseph McCarthy. He retired from politics after losing his reelection bid in 1954. Gillette passed away on March 3rd, 1973. Gillette was a member of Speculative Lodge No. 307 in Cherokee, Iowa.